Our T-PLY product lineup includes good and better roof and wall plywood sheathing. Both are backed by our enhanced packaging along with industry-leading warranties, ensuring you have a product you can depend on. Featuring the same high quality as our Standard sheathing, our Select grade offers a smoother faced structural grade panel that’s both strong and stable. Crafted from premium Douglas fir and Canadian softwood species, Tolko T-PLY square-edge plywood panels have the quality you want, at the price you need. 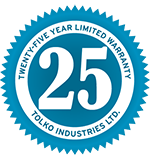 Whatever your sheathing needs, we have a product that meets your quality needs and your price point, all backed by Tolko values. For more information, check out our Plywood sales sheets as well as our warranties and installation instructions. When you want a smoother face structural grade panel, try Tolko T-PLY™ Pro Sheathing. It’s strong and stable. You’ll get all of the benefits of standard T-PLY™ sheathing in a higher-grade Select panel. Crafted from premium Douglas fir and Canadian softwood species, Tolko T-PLY™ square-edge plywood panels have everything you need in a structural panel. Call our plywood sales team to ask about sheathing.